On Aug. 28, MRU students, faculty and community members gathered for an unveiling of Calgary’s first permanent pride crosswalk between the EA building and the Riddell Library and Learning Centre. 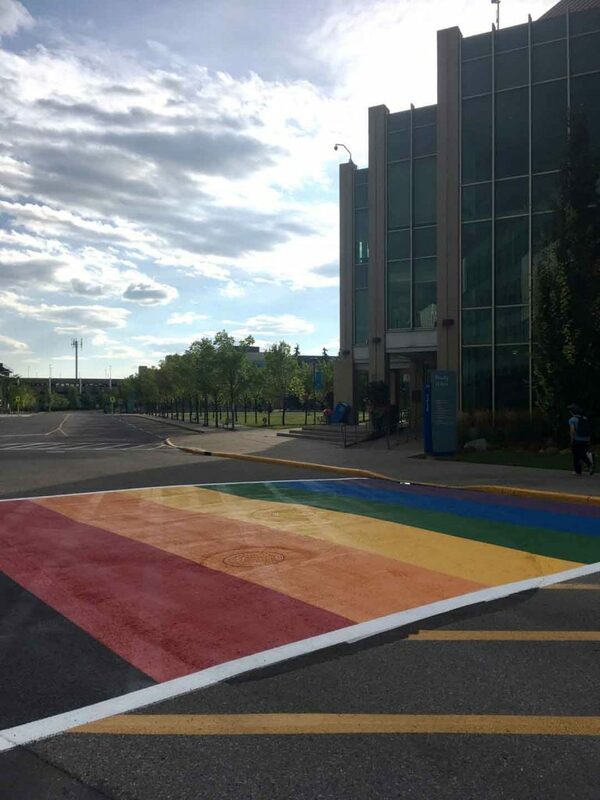 Morrison says that he is “thrilled” that MRU installed a permanent Pride crosswalk on campus. Calgary company, Zoom Painting, donated the installation of the crosswalk and has offered to maintain it for the next five years. This contribution is estimated to cost around $17,500. According to Calgary Pride, the $500 scholarship is awarded to two students who make an impact for the LGBTQ+ community. 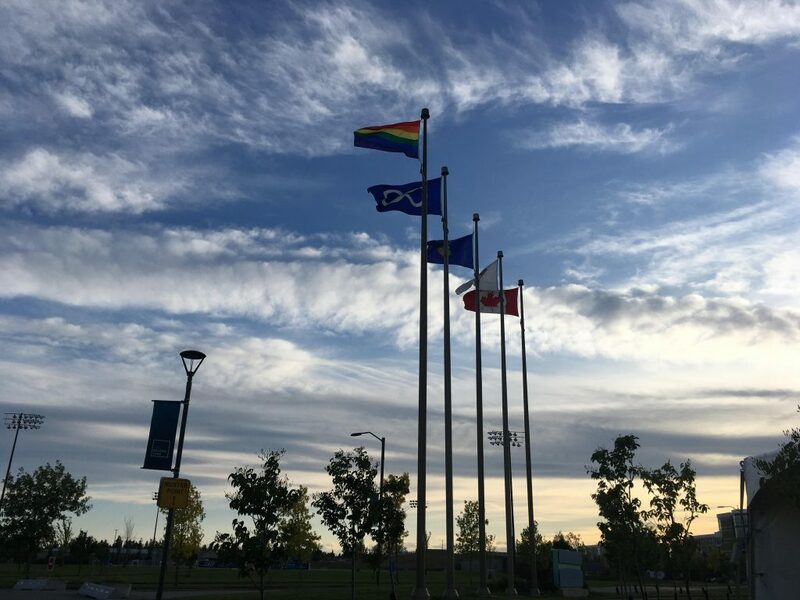 On June 15, Mount Royal University hosted a flag raising ceremony to acknowledge the LGBTQ+ community during pride month. The flag raising took place at the outdoor amphitheatre by the pond. The flag flew for the month of June and was raised again in August. Before the flag was risen, Provost Leslie Brown and Burrell gave speeches about what the ceremony meant to them. Brown shared a story about the personal meaning surrounding a previously attended Toronto Pride event. She expressed how important raising the pride flag was to her. “This flag symbolizes acceptance… it’s a flag for everyone” Brown says. In her speech, Burrell cautioned against becoming complacent with a lack of effort in the face of progress. “The flag is symbolic, but now more than ever, it’s important for our institutions to be intentional in demonstrating, publicly, that LGBTQ2+ people are recognized as a permanent part of our campus,” she says. “Raising the flag at MRU means more than checking off a box,” Burrell says. Those in attendance were also welcome to share their own comments and stories. MRU also participated in the annual Calgary Pride Parade on Sept. 2. Last year, the school had over 200 people from the MRU community march in the parade. According to Burrell, the changes that are happening on campus have come during an era of particular need. 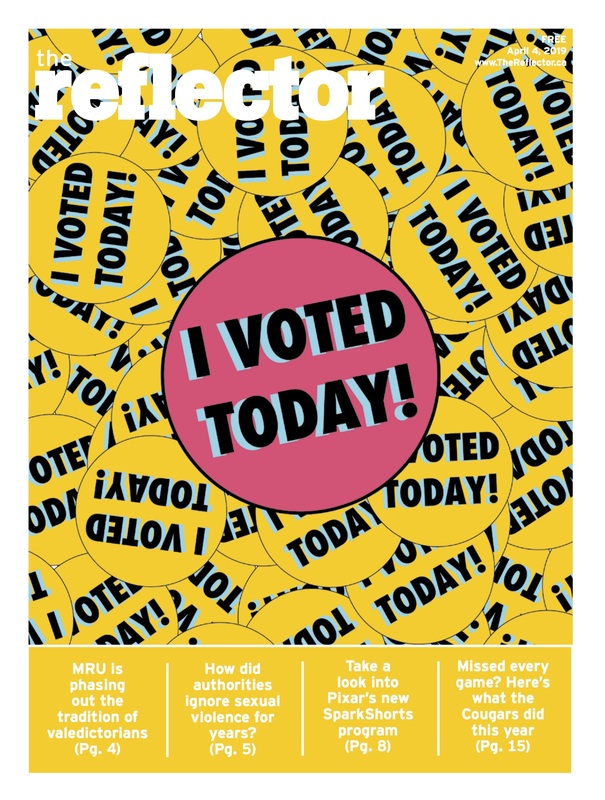 “In Alberta right now, Ontario, Canada, and in our neighbours to the South, we’re seeing backlash to the progress we’ve made from those who do not want queer and trans folks to lead public lives or exist in public institutions,” says Burrell.